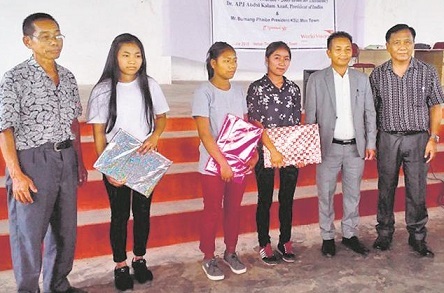 World Vision India, Mon Area Program organized a one-day career guidance and felicitation programme for successful candidates of the HSLC & HSSLC-2018 examinations from its 21 target villages, at Council Hall Mon Town on Saturday with C Nyamto Wangsha (National Teacher Awardee 2005) and Bumang Phaiba, president, Konyak Students’ Union as special guests. Bumang Phaiba, on behalf of the Konyak Students’ Union congratulated all the successful candidates. He urged the students to develop strong characters and not to shy away from learning but always keep in touch with books. He told them to stay away from intoxicants and opium and encouraged them to prioritize, set goals and keep working sincerely to achieve them. Earlier, a welcome address was given by Asenla CSE; David CSAM felicitated all the students with gifts on behalf of the project. Temjen Anar, CDF, while proposing the vote of thanks, gave a brief overview of the 382 successful students, village wise. The programme was presided over by Nobin Molsom, CDF, and Rev Henshak Konyak offered a special prayer for the students.